In light of the ongoing War on Christianity, the Anglican Internet Church Bookstore offers a new book which can help any Christian defend himself or herself against the assaults of the aggressively secular and often anti-Christian world. The paperback edition will be available later this week from my Author page at Amazon. A Kindle edition will be prepared later this month and also be available on Amazon.com. In the next few weeks the paperback edition will be available through your local bookseller (ISBN: 978-1502765147). 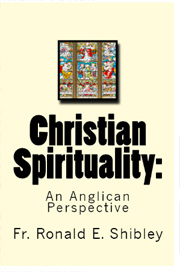 Christian Spirituality: an Anglican Perspective is a handbook to the Eastern Church concept of Christian Spirituality presented in the context of the Anglican teaching and worship experience. In Part One I introduce the topic and present the writings of Archbishop Thomas Cranmer and the Blessed Lancelot Andrewes as examples of Christian Spirituality applied to Anglican worship and prayer. In Part Two (“Seeing” the Invisible God) I explore the two Old Testament understandings of “face of the Lord” and present the Christ Pantokrator icon from the monastery of St. Catherine in Sinai as the New Testament way of “seeing” God; then explore a new spiritual way of “seeing.” In Part Three (Blessed Is the Man…) I explore the meaning and uses of Blessed is, blessed are, blessed be in the Psalms and New Testament, and the meaning of key terms: godly, ungodly, righteous, righteousness, heart, fear of the Lord and way(s). In Part Four (Put Not Your Trust in Princes…) I offer practical applications of the theory of Christian Spirituality in a 21st Century context of obsession with excess and offer guidelines for personal prayer development, the writing of personal catenae, and explore examples of Apostolic Wisdom, demonstrated in the work of two pairs of saints: Paul & Peter and James & Jude. Later this year I will develop a series of short videos adapted from the book, focused on specific topics mentioned in the book. These will be available free of charge on the AIC’s You Tube channel. Also later this year, the AIC will offer a new series of videos intended to make it easier for anyone, anywhere, to pray the daily hours (offices) of 1st, 3rd, 6th and 9th Hours, plus Vespers and Compline from Hear Us, O Lord: Daily Prayers for the Laity (also available from my Amazon author page).